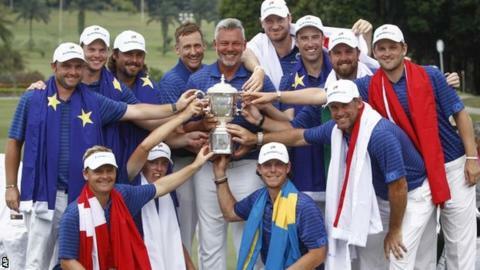 Europe led from start to finish to secure an emphatic 13-point victory over Asia in the EurAsia Cup in Kuala Lumpur. Darren Clarke's men led 9-3 heading into the third day of competition, and a dominant performance in the singles saw them wrap up an 18½-5½ victory. Danny Willett clinched the win with eight matches still out on course. His fellow Englishmen Ian Poulter, Andy Sullivan, Lee Westwood, Matt Fitzpatrick and Chris Wood also won. Swede Kristoffer Broberg, Denmark's Soren Kjeldsen and Frenchman Victor Dubuisson were also victorious in the singles, while England's Ross Fisher tied with Jeung Hun Wang. Austria's Bernd Wiesberger and Irishman Shane Lowry were the only Europeans to lose on the final day, to KT Kim and Anirban Lahiri respectively. This was the second staging of the EurAsia Cup, which replaced the Royal Trophy. Victory delighted Clarke, who will captain Europe's Ryder Cup team when they take on the USA in Hazeltine, Minnesota in September. "If your players don't play and don't perform then you can be the best captain in the whole world and you're not going to win, so the credit doesn't belong to me, it belongs to the players," he said. "The quality of the golf they have played this week has been brilliant."